Inventory management and procurement compliance often present a difficult challenge for any manufacturing organization, regardless of how strict and disciplined it may be. While many procurement teams feel they have effectively leveraged spending through preferred supplier negotiations and strategic purchasing processes, the reality is that they have only hit the tip of the iceberg. The main factor that holds many organizations back is data quality or lack thereof. Some parts, and their associated description, radiate with accuracy and attribute information. Unfortunately, this only represents about 10 percent of the items in a given database. More realistic are items that barely have a part number or any type of description that would allow the preferred supplier to accurately provide a replacement part. Without clean data, there is a good chance that the agreement, which was originally negotiated with the preferred supplier, doesn't accurately represent the organization's true spending. In most cases, the majority of companies can't tell definitively what they bought, who they bought it from and how much they bought it for in the past week, let alone the past 12 months. Implementing a successful inventory optimization program involves several phases, none of which can be completed effectively without first having quality data. The following cost-savings progression model illustrates the critical tasks necessary to achieve maximum success. Let's face it; manufacturing companies specialize in producing finished goods, not in cleaning data. Perhaps this is why their data has become so corrupt in the first place. In any case, it is always best to leave this task to the subject-matter experts who specialize in the field of material and vendor master data cleansing. Prior to project commencement, a standard operating procedure will be developed to clearly articulate the naming convention, abbreviations, policies and formatting requirements that will be used to consistently structure data throughout the organization moving forward. Next, legacy data will be cleansed, standardized, enhanced and validated to provide an item master that is consistent among product groups while containing accurate and attribute-rich descriptions. 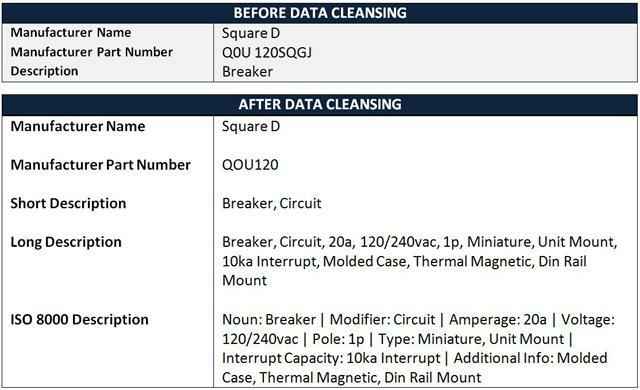 Once clean, the data will be formatted to meet the specific configuration requirements of the chosen enterprise asset management (EAM)/computerized maintenance management system (CMMS), including field type, character limitation and data arrangement. During the cleansing process, potential duplicate records will be identified at both the local (plant) and corporate level. The newly cleansed item master will provide detailed visibility and reporting at the stock keeping unit (SKU) level. In addition, data cleansing and classification will enable items to be segmented into common product groups or commodities. On average, a typical item master houses 30 percent original equipment manufacturer (OEM) items versus 70 percent standard maintenance, repair and operations (MRO) items. From there, these two categories are broken down into seven or more parent product groups, as shown below. 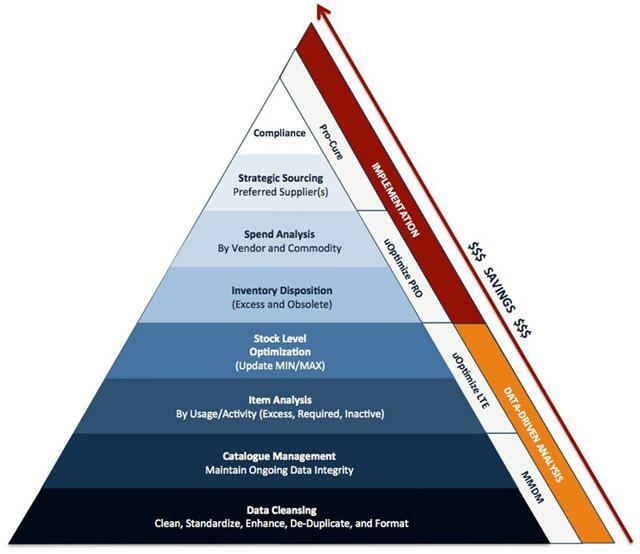 These common categories can be further segmented into subcategories and analyzed throughout the item and spending analysis phases. Immediately upon completion of a data-cleansing project, a catalog-management strategy must be implemented to maintain ongoing consistency, integrity and sustainability of the item master. The catalog-management task can be performed manually by internal resources, using automated software or through a third-party service provider. Regardless of which method is chosen, a data governance team must be formed in order to restrict enterprise resource planning (ERP) access and create a corporate internal workflow for requesting additions, modifications, extensions and suspensions to the item master. During the catalog-management process, all item master updates and entries will be standardized and formatted according to the standard operating procedure, which was developed during the initial data-cleansing project. An effective catalog-management strategy will therefore maintain consistency and accuracy while preventing future duplication within the corporate item master moving forward. Of the total on-hand inventory, industry standards suggest that required active items represent 25 to 30 percent, excess active items represent 10 to 20 percent, and inactive items represent 50 to 60 percent. The excess active category represents a safe inventory reduction opportunity with immediate cash-flow generation potential, which can often be used to fund the initial data-cleansing project and build a solid business case for finance. With excess inventory now identified through item analysis, the stock level optimization process can begin. After all, the last thing you want at this stage is to continue overstocking inventory due to inaccurate and outdated minimum/maximum or reorder-point/reorder-quantity (ROP/ROQ) levels. Using a complex formula, which considers variables such as criticality, issue quantity, issue frequency, average lead time, etc., optimal minimum/maximum levels can be calculated to minimize on-hand inventory while safeguarding against future stock outs and unplanned equipment downtime. In the example above, the blue-shaded fields represent existing inventory values, while the red- and gray-shaded fields represent calculated values. Based on the existing inventory information and client requirements, it was determined that the average lead time for this particular bearing sample was 3.5 days, and the new minimum/maximum level was to be adjusted to 2 and 4. Using the new minimum/maximum values, it was calculated that four of the eight current on-hand items were actually required, while the remaining four represented excess stock. To take inventory safeguarding one step further, a stock status report can be performed to identify part availability and lead time at the preferred vendor's local branch, regional branch and corporate distribution center. Of the above-mentioned strategies, third-party liquidation often provides the quickest and easiest success for companies, as it requires few resources, payment is immediate, and inventory is removed from the site within a short period of time. The downfall to this strategy is that it may not provide the payback for which you were hoping. In many cases, third-party liquidation will deliver 10 to 30 cents on the dollar, which for some organizations is simply a bonus just to get the unused inventory off their shelves. However, if you're looking for larger returns, you may want to consider an e-commerce solution or discuss vendor buy-back opportunities when negotiating your next supply contract. No matter how staggering the results may be, these data-driven statistics will become the foundation for leveraging spending and achieving cost savings during the strategic sourcing and negotiation phase of the procurement process. Now we're getting down to the fun part, strategic sourcing and negotiating. 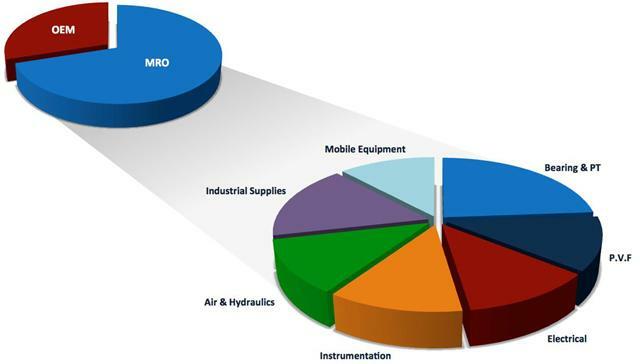 It's often surprising just how many companies have never tendered their MRO spending or have only focused on a small portion of it, especially considering the competitive nature of the industrial distribution space and multitude of cost-savings opportunities that are available. With accurate spending analysis reports now available at your fingertips, it's time to create an RFx to identify and select the best-suited vendor(s). Once again, the RFx process can be performed by internal resources or through a third-party service provider. In either case, be sure to leverage your spending analysis reports and provide a quality market basket to obtain the most accurate product quote. Keep in mind that price isn't the only factor to consider during an RFx. While it may be one of the most heavily weighted components of your RFx, other factors such as lead time, availability, terms and conditions, guaranteed cost savings, and special incentives should also be taken into great consideration. Remember, if you have important requirements that are non-negotiable, make them known to bidders and don't just ask — demand them. The better you outline your requirements within the RFx, the more likely capable bidders are to meet them. Once you've narrowed it down to a short list of vendors, the real negotiations begin. Be creative with the things you want, firm with the things you need and know when it's time to walk away. Chances are you'll be entering into a long-term contract, so it is important that the final agreement be mutually beneficial to all parties. Compliance is the last remaining piece of the puzzle to ensure ongoing procurement success and maximum operational efficiency. Traditionally, strategic sourcing and compliance has been based on preferred vendor programs and lenient purchasing procedures, which as we know, were driven by poor data. Too often buyers disregard preferred vendor programs with no repercussions just so they can buy from the local supplier with whom they have an existing relationship. Nowadays, as competition becomes stronger, budgets continue to shrink and technology advancements are a daily occurrence, companies must tighten up their processes to ensure that every dollar is spent wisely. How you ask? The answer is in this article, yet everything you've read thus far means nothing if it is not enforced down to the finest detail and end users do not comply with the cost-savings programs that have been negotiated. Let's be honest, there's no point in establishing a preferred vendor program if you're not going to honor the contract. The key is not only to enforce compliance at a high product group level through the preferred vendor, but also down to the individual SKU level (by manufacturer). With outsourcing and contract work now trending throughout industry, third-party procurement companies are often a great solution to manage purchasing and compliance. If you choose to use internal resources, you may want to consider a software solution, which will force users to purchase only from preferred vendors. Of course, there are exceptions such as catastrophic breakdowns and part unavailability through the preferred vendor, in which case the user must specify a reason as to why the part is being purchased from a non-preferred vendor. If nothing else, this process instills ownership and accountability, as end users are aware that upper management is monitoring their purchasing habits. To summarize, achieving cost savings is not a quick, single step task. It is an ongoing process that requires a number of phases, beginning with data quality. Whether you choose to perform the above-mentioned tasks internally or through a third-party service provider, the process and cost-savings opportunities remain the same. For your organization, the best option may be to perform a select group of tasks internally for which you have adequate resources and expertise. As for the remaining tasks, build a relationship with a third-party service provider who specializes in the field and is flexible to meet all of your business requirements and objectives. Every company specializes in something, and for most that something isn't data cleansing or inventory optimization. Stop spinning your tires. Stick to your specialty and let the subject-matter experts perform theirs. It's a win-win situation in the end, which will see you achieve your cost-savings and procurement objectives within a much more reasonable timeline and scope.